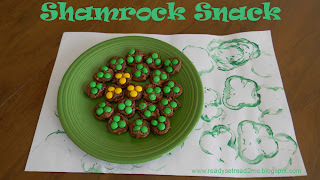 I found these cute shamrocks snacks on Pinterest. Simply melt a rollo on a mini pretzel and add green M and Ms These were pinned from Once Upon a Dream. Her version was made from melted Hershey's kisses and had piped icing for a stem. They were super cute, so go check them out. That was just too much work for us! We also ran out of green m and ms and we made some lucky yellow shamrocks. A great book to enjoy while you share your snack is Hooray for St. Patrick's Day by Joan Holub. This book is probably best geared for 2-5 year olds. It would be great for kids who don't have a lot of background knowledge of St. Patrick's Day. The rhyming text explains some fun St. Patrick's Day and Spring activities like parades and picnics. The children in the story also make St. Patrick's Day crafts and do a play about St. Pat's. This story opens up to a lot of extensions. It is a lift the flap book which is great for young kids. The illustrations are cute and feature children of various ethnic backgrounds. 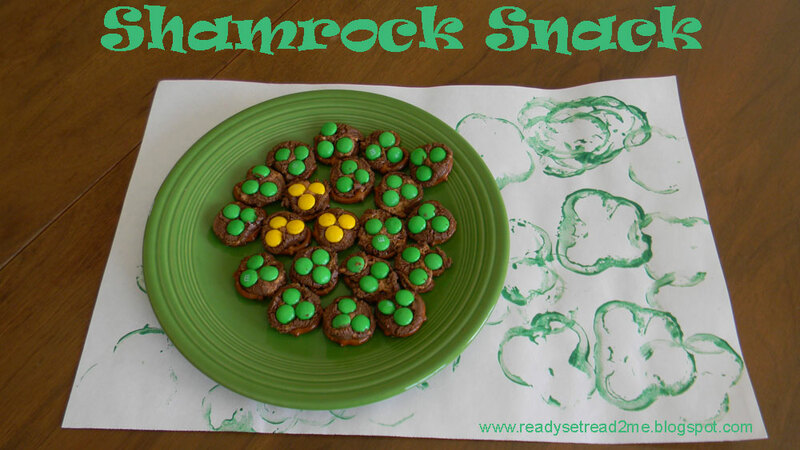 Do you have a favorite St. Patrick's Day snack? Fun and colorful, and Rolos are always yummy! Thanks for sharing! This is such a great idea! It is pretty and yummy! Thank your for linking to Read.Explore.Learn. I'm stopping by from you read.explore.learn link- this blog looks like it's right up my alley- I'm going to go explore a bit!